18,280 solar panels could be installed on farmland at Ulley in Rotherham under recently submitted plans for a new solar energy project on the site of a wind farm. Renewable energy firm Banks Renewables is looking to install a 5MW solar photo voltaic (PV) scheme in the south east corner of its Penny Hill wind farm site, which sits to the south east of Rotherham and west of the junction of the M1 and M18. The Durham-based developer secured planning permission for the six turbine wind farm at Ulley in 2010. Backed by £21m from the Co-operative Bank, turbines with a maximum height of 132m were built on green belt land. Approximately six hectares of current agricultural land would be covered by solar panels, up to three metres in height. If approved, the installed capacity of up to 5MW would provide enough electricity for approximately 1,320 homes. Approximately 18,280 panels would be installed rated at 270W with the lower edge around one metre above ground level enabling safe grazing by smaller livestock. The planning approval would be for a temporary period of 23 years, the same length of time that the wind turbines are set to be in operation, and the developers are offering to add to the £40,000 made available for local community causes. Banks said that it has designed the project to allow for its existing grid connection on the Penny Hill site to be used for the new scheme, and is also using the existing access tracks to further minimise any impact on the local community. The plans state that a key characteristic of the development is its "low impact and high reversibility," adding that "the design will not involve the introduction of concrete foundations or large areas of hardstanding. This will enable the infrastructure to be easily removed following its operational life and the site to be restored to its current arable use." It adds: "The site is well contained by the surrounding landform and is screened by the boundary vegetation. Effects on landscape character and landscape value are not predicted to be significant. Due to the topography visibility is predicted to be limited to 1km, and effects will reduce quickly with distance. 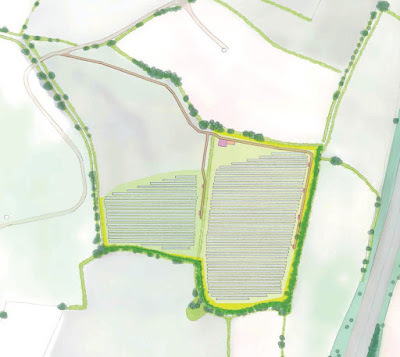 Where there will be visibility, the solar farm would be viewed in the context of the nearby M1 motorway." Lewis Stokes, development relations coordinator at Banks Renewables, said: "We have held a number of consultation events and meetings in the community about the proposals, and the response has been fantastic. We know the benefits delivered as part of the Penny Hill wind farm have had a huge impact on projects locally and the solar farm brings an opportunity to do further work in the community. "However we're not only looking to create a positive effect within nearby communities, we will also encourage greater biodiversity and support the creation of enhanced habitats alongside increasing the amount of clean, green energy we produce at Penny Hill site working with the relevant bodies and local interest groups too."